If you’re anything like me you love looking up the workouts of professional athletes – especially NFL and NBA players. A lot of athletes will post short video clips to Instagram showing a glimpse of their workout, but very rarely do they show the whole workout. 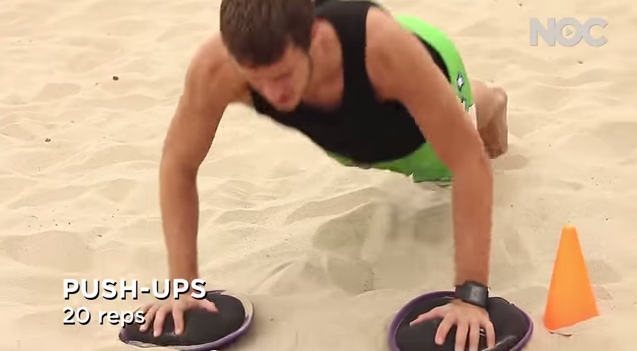 Recently I came across a 4-part series on Youtube of Miami Heat point guard Goran Dragić’s off-season conditioning workout with his personal trainer. Usually the workouts I find are based heavily in lifting HARD (this is particularly true for a lot of NFL players), but I thought you would like this one since it includes lots of core work! Watching the videos is kind of cool because the trainer and Goran tell you the benefits of each workout and also share his heart rate throughout it. Side Planks x 24 reps using hand weights. Pushup in between each rep. Double Leg Hip Extensions – hold for 1 minute. Don’t drop the ball held between knees! Followed by “up and downs” – continue to hold the ball between your legs and move up and down to hit the trainer’s finger x 30 reps. Single Leg Hip Extensions – hold each leg for one minute. In between each leg do single leg “up and downs” for 30 reps.
Get Ups – holding a weighted sandbag, get to your feet without using your arms for assistance. 12 reps each side. Diagonal situps 30 total (15 reps each side) using weighted sandbag. Flutter Kicks x 100 reps holding a weighted sandbag overhead. Deep Squat Pressouts x 12 reps using weighted sandbag. Deep Squat Press Ups x 30 reps using weighted sandbag. 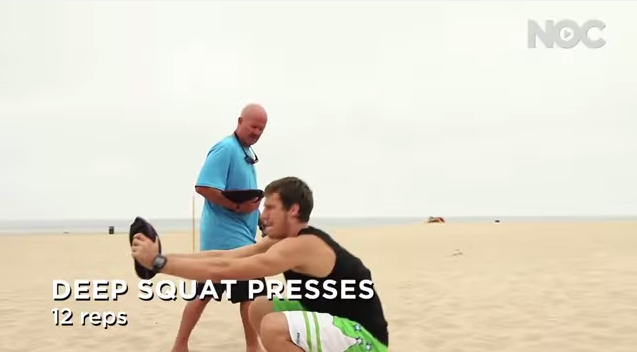 Go into squat position and then press sandbags up. Walking lunges with weighted sangbags. Walks the 4-cone perimeter. 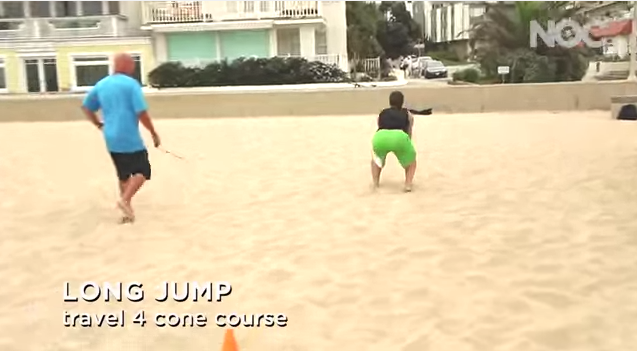 Cone Reach and Touch x 40 reps each leg. If you lose balance and touch the ground start the reps again. Shuttle run – complete in under 1:30. The first thing Goran does in this video is the shuttle run – really interesting – give it a watch! Long jump traveling the 4-cone course. 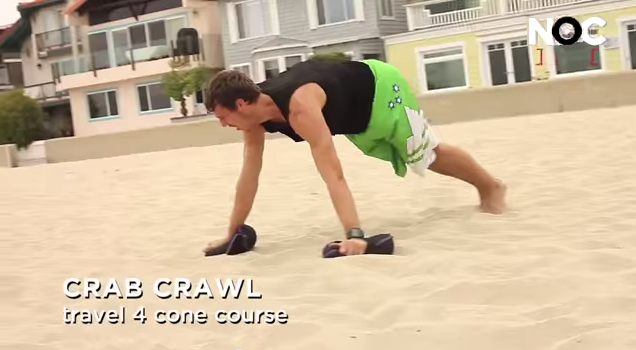 Pushups x 20 reps and then crab crawl to the next cone and do 20 more pushups until you travel the 4-cone course. Try not to take any rest breaks throughout. I hope you enjoyed this workout and maybe got a few ideas to incorporate into your conditioning work! Do you like looking up pro athlete workouts? Which pro athlete (that’s not a runner) impresses you the most? I’ve actually never even thought to look up pro athlete workouts, but that’s a great idea since whatever they’re doing is clearly working! I don’t really follow specific pro athletes other than runners, haha! I love watching pro athletes workout, it’s my favorite form of workout inspiration! Yikes!! This workout looks brutal!!! The warm-up alone is tough! Definitely going to try some of the moves here that are new to me!!! I know! A five minute plank as part of a warmup? Holy cow! The “get ups” were interesting. I’ve never heard of that before at all. It looked really tough, even Goran was struggling towards the end. 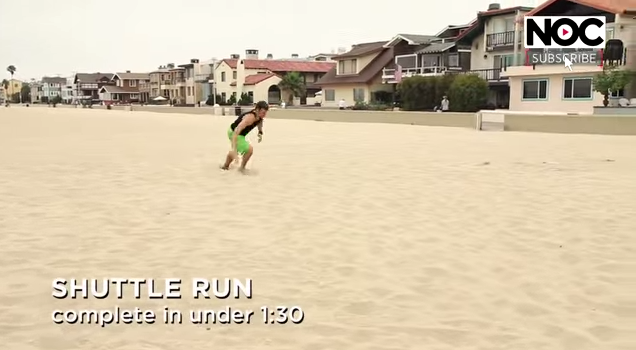 I feel like side planks in the sand would be amazing…holding my feet in a side plank always hurts my ankles! I agree, planking in the sand sounds really gentle! 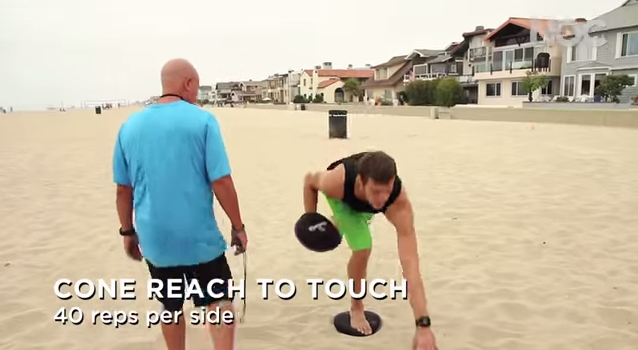 Just doing the workout in sand–Wow! I agree with Ali, side planks in sand would be more comfortable! (I try and have my sneakers on, and that helps too). 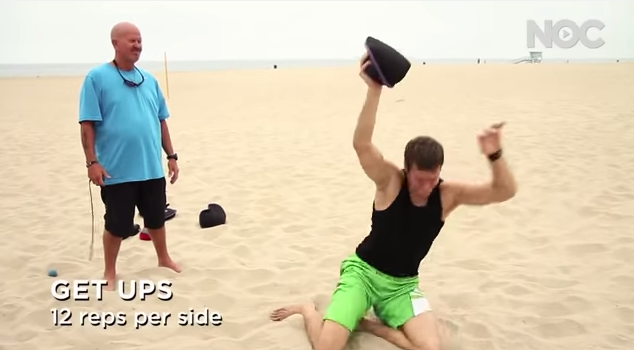 The hip extensions (bridges) while holding the ball–GREAT exercise for runners! 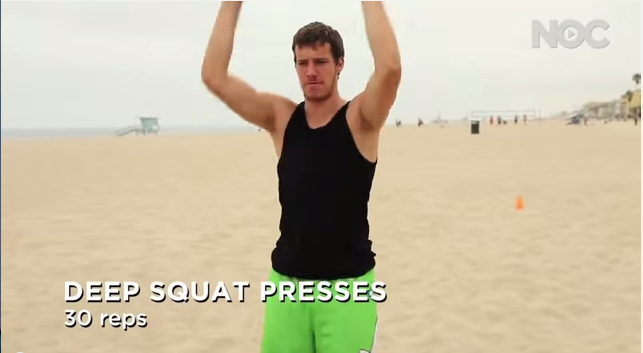 I have never thought of looking up pro athlete’s workouts. Very interesting! YES! I have planked without shoes on before and my toes were dying. I tried the bridges with ball yesterday and it was easier than I thought it would be! Oh wow, that’s awesome that they posted the whole workout… I’m going to save this post for when I’m back on my feet! 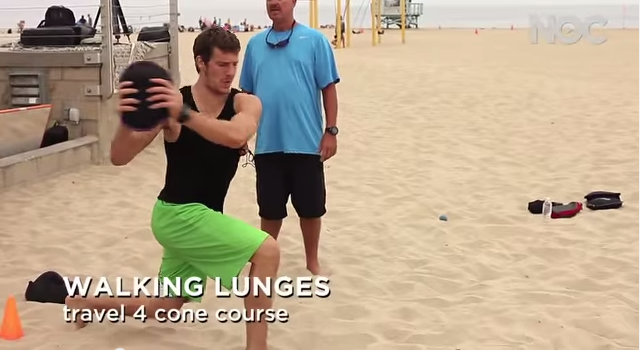 I’ve never thought to look up a pro athlete’s workout but it seems like a good idea. My favorite athlete is Emily Batty. She is a mountain biker and I think she’s really bad@$$. I’ve never heard of Emily but now I’m going to go look her up and see if she has any workouts posted ;). I can kind of fathom the 5 minute plank, but I would be totally spent after it. That would definitely not be part of my warmup!!!! I can’t imagine doing that and then all of those other workouts that require use of the shoulders and core. My body would just totally shut down! This looks very difficult! I like the idea of a side plank with a push up in between. Hmmm … I think you could do the whole thing even better than Goran does! I would put money on it!